Tablets are complicated! 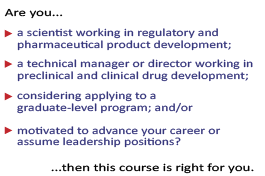 Participants taking Foundational Course 1 will learn how to: (1) better create stable and effective dosage forms through an application-based curriculum using real-world drug development challenges; and, (2) learn to identify the appropriate framework for solid formulation selection and evaluation, while considering manufacturing and regulatory hurdles. The Solid Oral Delivery Systems can be taken on its own. Or, take additional courses to earn a Certificate in Pharmaceutical Science & Technology. Students will receive a discounted fee when registering their fourth course.